Colleton County Fire-Rescue will be holding pre-employment testing (PET) to fill two full-time Firefighter/Paramedic positions (24/48 shifts) and one full-time Firefighter/EMT or Firefighter only (must obtain EMT within one year) assigned to D-shift (Monday through Friday, 0800-1800). Applications must be sent in through the SC Works office. Click here for more information. If you have submitted your application and have not received a phone call scheduling you for testing, please contact Fire-Rescue headquarters at (843) 539-1960. A single vehicle MVC sent two adult females to the hospital Tuesday afternoon 26-April. 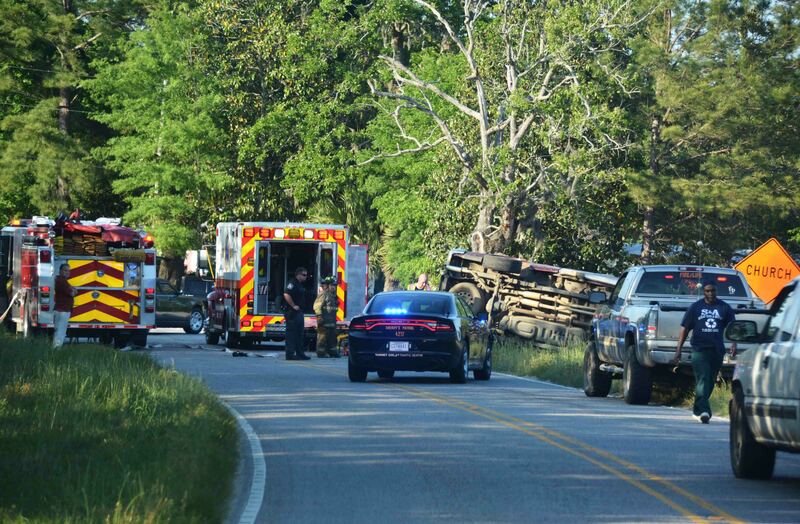 At approximately 18:27, a southbound Ford pickup left the roadway on Rehoboth Road (SC Hwy 651) at Van Dyke Road. The truck flipped over several times before coming to rest on the driver’s side. Both occupants were trapped in the wreckage. It is believed the driver suffered a medical emergency prior to the crash. Crews from Station # 9, located a mile from the scene, arrived within minutes. Click here for more information. An adult male was critically injured after he failed to negotiate a curve and crashed his motorcycle Tuesday afternoon 26-April at 18:11. The man was running from Walterboro Police units and fled south on Hendersonville Hwy (US Hwy 17-A) reaching speeds in the triple digits prior to the crash. He turned west on to Brick Chimney Road and lost control in the 700 block. 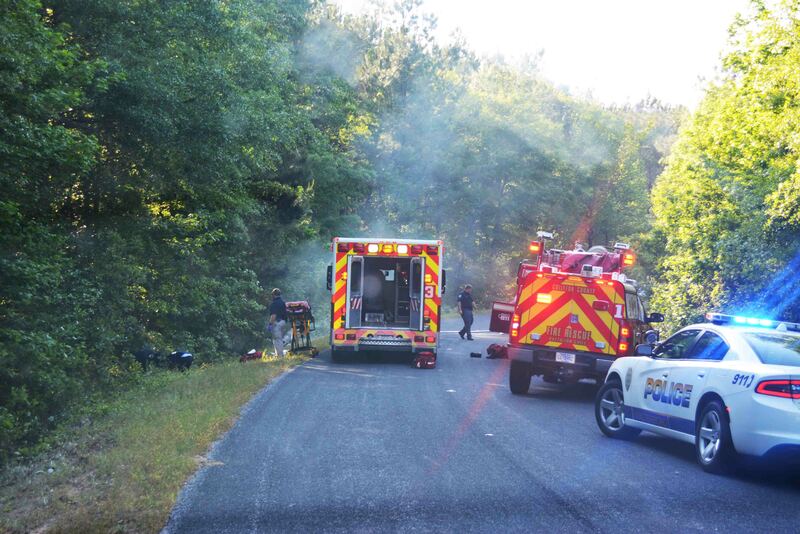 The man was ejected from the motorcycle and thrown into the woods. The motorcycle landed approximately 120 feet west and caught fire. Click here for more information. 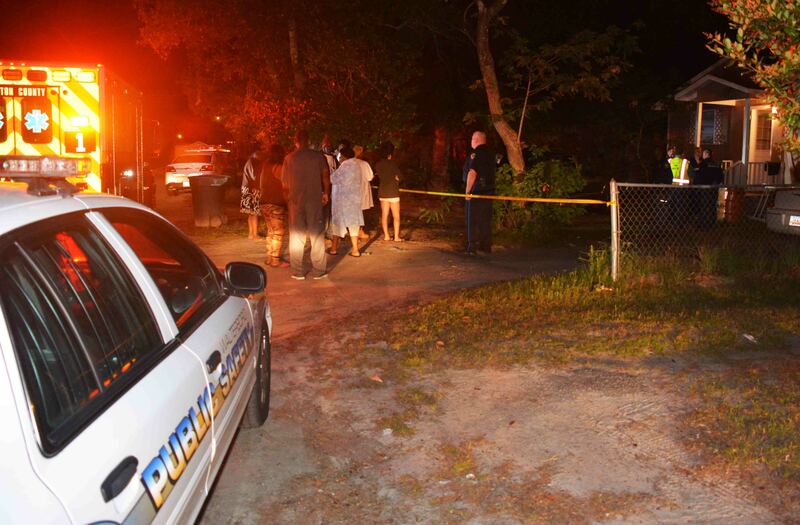 An adult male was fatally shot at 126 Lewis Street Monday morning 18-April. At 00:27, 9-1-1 received reports of gun fire at the location. Walterboro Police units arrived within minutes and secured the scene. Firefighter-Paramedics found the male victim with multiple wounds inside the home. He had no signs of life. WPD and the Coroner’s Office are investigating the incident. Colleton County Sheriff’s Deputies assisted with scene control. Click here for more information. 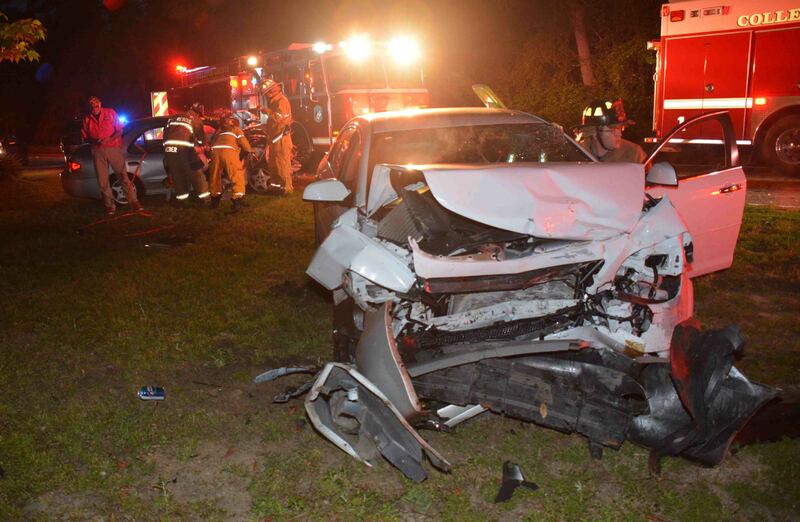 Two vehicles collided head-on in the 3800 block of Charleston Hwy (SC Hwy 64) Saturday evening 16-April. 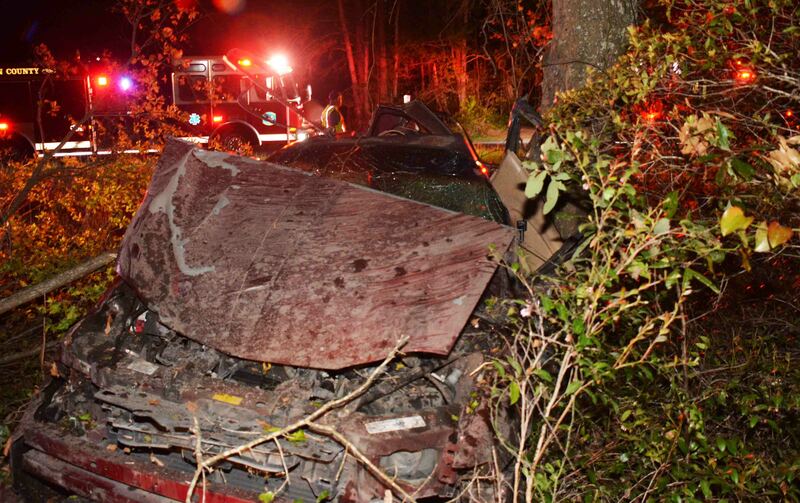 Callers notified 9-1-1 at 20:11 advising one person was trapped in the wreckage. Fire-Rescue arrived to find both passenger cars on the east bound shoulder with front end heavy damage. The male driver of the Malibu suffered life threatening injuries and quickly stabilized at the scene. He was rapidly transported to the Trauma Center at Trident Medical in Summerville in Medic 19 with additional Firefighter-Paramedics on board to assist with his care. Click here for more information. 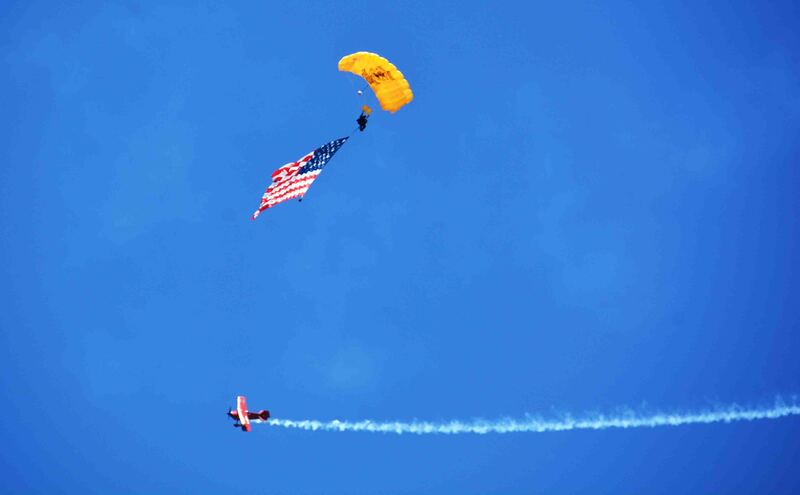 The Lowcountry Regional Airport hosted their annual Wings and Wheels air and antique automobile show Saturday 16-April. The weather was beautiful and the event was attended by several thousand spectators. The crowds were treated to vintage aircraft, aerobatics, para-troopers, vintage, modern and experimental aircraft and an antique car show. Stations 19, 24 and LifeNet 4 covered the event. Click here for more information. Our condolences go out to Captain Roger Johnston on the death of his mother-in-law. Melanie Elaine Bouchette McClure, 52, of Rowesville, died Thursday, April 14, 2016 at her residence. Funeral services will be held at 3 p.m. Sunday, April 17, at Memorial Church of the Nazarene in Orangeburg, with the Rev. Billy Williams and the Rev. Kevin Sprague. Burial will be in Crestlawn Memorial Gardens in Orangeburg. Visitation will be held from 6 to 8 p.m. Saturday, April 16, at Memorial Church of the Nazarene, 569 Berry St. in Orangeburg. Memorials may be made to Thompson Funeral Home Inc., 1012 Whitman St., Orangeburg, SC 29115. 15/April/2016- We wish to congratulate Firefighter/Paramedic Brian Bishop and his wife Whitney on the birth of their son. Seth Connor Bishop was born on 4/14/2016 weighing 8.2 pounds and 20.75" long. 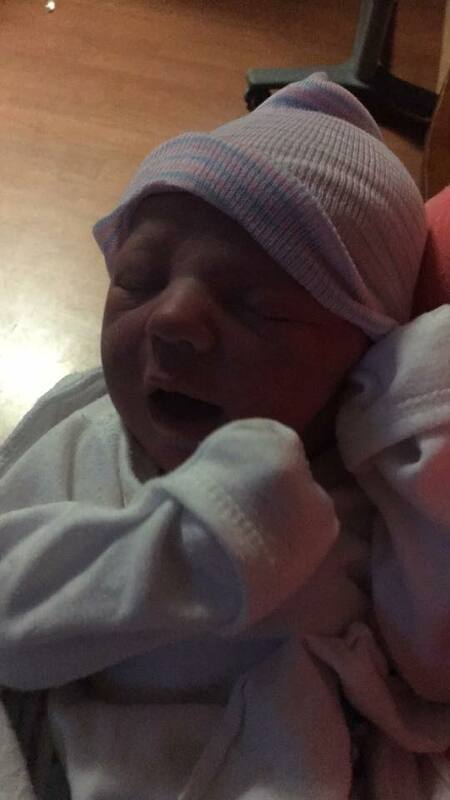 Both Whitney and Seth are doing great. 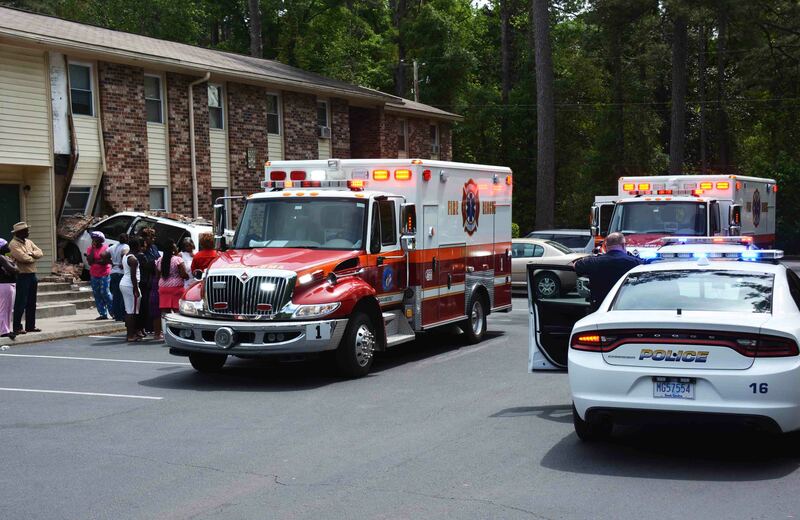 A woman and four children were transported to Colleton Medical Center after a minivan ran into the 100 building at Lincoln Apartments, 404 Witsell Street, Sunday afternoon 10-April. At 13:47, 9-1-1 received a report of the accident reporting the woman and children were trapped in the van. Walterboro Police Officers arrived quickly and determined no one was trapped. After Medic 1 arrived, they began treating the injured and requested a second Medic Unit due to the number of patients. Click here for more information. 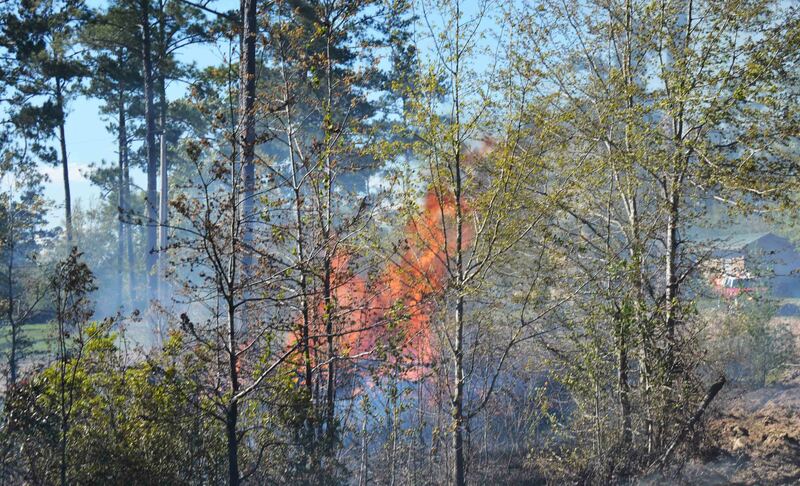 Multiple Fire-Rescue Units and Forestry Commission Tractors responded to an estimated 75 acre woods fire Friday afternoon 08-April. At 15:40, 9-1-1 began receiving reports of the fire from callers from the 4900 block to the 5300 block of Lowcountry Hwy reporting the large fire and heavy smoke. Engine 13 arrived to find zero visibility on Lowcountry Hwy. After locating an access point to reach a portion of the fire, crews found the fire originated as a 25 acre controlled burn, but it spread out of control due to 15 to 20 mph winds. Click here for more info. An adult male was critically injured in a single car MVC on Mt. Carmel Road south of McLeod Road Thursday evening 07-April at 23:14. The north bound Monte Carlo lost control in a curve and slide sideways into a ditch. After sticking the embankment, the car became airborne and struck a power pole about four feet off the ground. The impact broke the pole in two pieces. The car them flipped over several times before striking a tree at the wood line. A neighbor heard the crash, went to investigate and called 9-1-1. Click here for more information. An adult male and adult female were injured in a two vehicle MVC on Hampton Street at the intersection of Padgett Loop Wednesday evening 06-April at 18:40. The small car collided with a street sweeper causing damage to the passenger side of the car. Due to her complaints of injuries the female passenger could not be removed through the driver’s side. 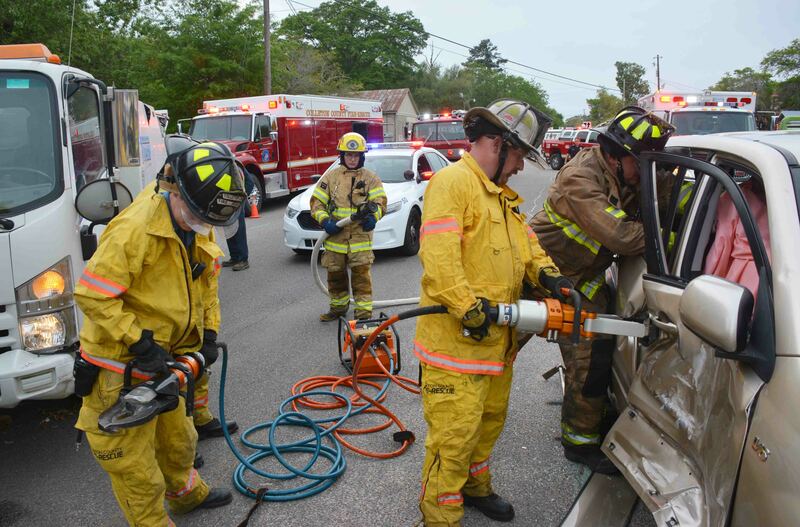 Firefighter-Paramedics used Holmatro Rescue Tools to remove the passenger door and safely extricate the woman. Click here for more information. 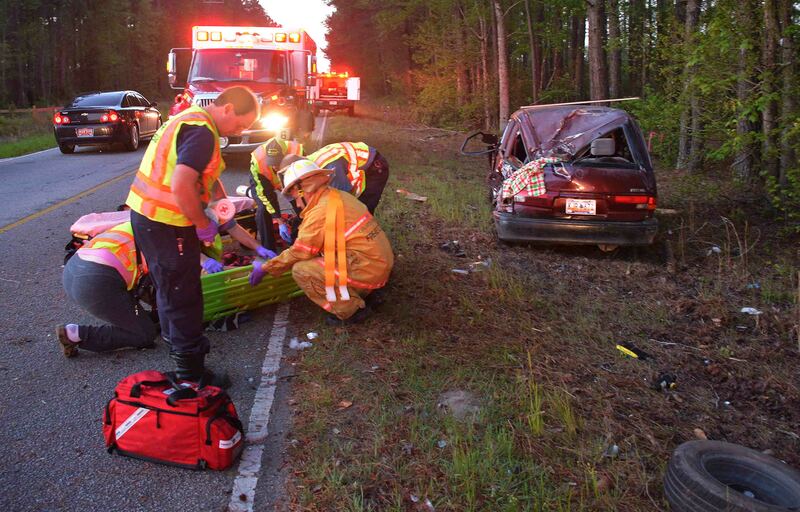 An adult male suffered multiple traumatic injuries after being ejected from his minivan in a high speed MVC on Green Pond Highway (SC Hwy 303) north of Runner Lane. The southbound minivan dropped off of the roadway and overcorrected, causing it to leave the roadway and strike several trees. The driver was ejected into the roadway. Several passing motorists stopped to assist the man on the stretch of rural highway. Click here for more information. Two people were injured, one fatally, in a four vehicle MVC in the 3800 block of Sniders Hwy (SC Hwy 63) Sunday evening 03-April. At 18:49, Sheriff’s Sgt. J. Lawson was on patrol, when he witnessed the collision. 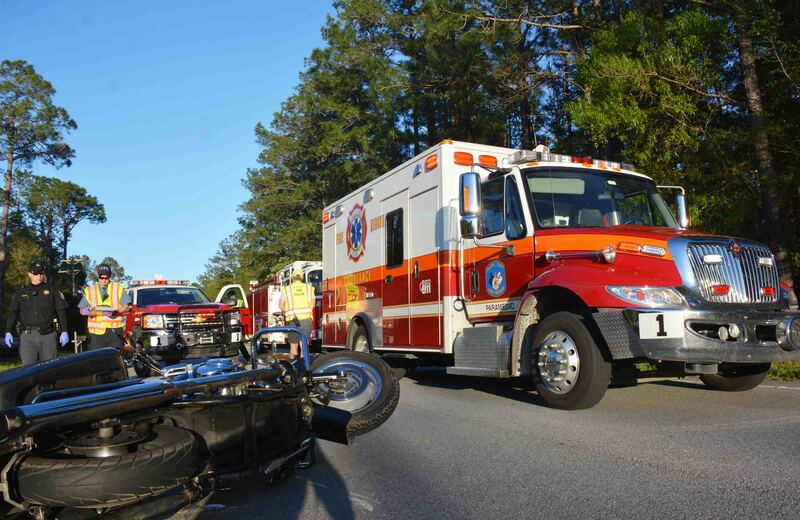 A northbound motorcycle collided with the rear of a northbound pickup, ejecting the occupants. A southbound vehicle, then struck the adult female rider causing fatal injuries. The adult male patient suffered multiple traumatic injuries, including a head injury. Click here for more information.